DVD Decrypter is a free application that allows users of Windows-based computers to create backup copies of their DVDs. After running the software and inserting the target DVD, the content is converted according to the user’s specifications. 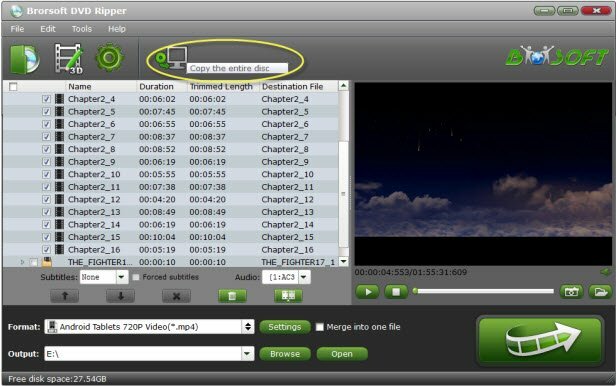 Here’s the step-by-step guide on how ot rip and backup DVD free with DVD Decrypter for you guys. Just read on. 1. Insert DVD disc to DVD drive on PC, then run DVD Decrypter and select Mode -> File. 2. Then click the “Tools” button to open the “Settings” window-> Settings. 3. Go to the “File Mode” tab and change the settings to this ones. Click OK.
4. After you make sure that all the files are selected click the button to start the ripping proccess! In fact, DVD Decrypter has been discontinued and is unable to support lastest DVD discs with newest copy protections. In this case, a best DVD Decrypter alternative is needed. Here, Brorsoft DVD Ripper is highly recommend to remove the commercial DVD copy protection such as: DVD region code, DVD CSS, UOPs, etc. It’s easy job to rip DVD, Video_TS, ISO files to popular video formats like: H.265/HEVC, H.264 MP4, AVI, MOV, WMV, FLV, MKV, 3GP, etc.